Lawali has come to faith through the witness of our evangelists in Niger. Jennifer Weppner served as an intern with Samaritan’s Purse in Niger. The approach of our caravan was very different from the line of camels the Taureg people rode as they passed us in the sand dunes. Their richly colored fabrics against the horizon of sand captivated me until they were out of sight as we sped on toward the village they were coming from—Bamban Katami. Children peeked around corners as our rugged vehicles ground to a halt in this remote community in the Sahel Desert. Reservations from women and children regarding our presence were as palpable as the heat that rushed into the open doors of our vehicles. Yet, little by little, they started crowding around us. It was like we were watching a beautiful flower take its time unfurling to us. This, I’ve learned, is Niger—this uncanny quiet followed by full immersion into a mix of sounds, colors, and the beauty of its people. These curious locals from Bamban Katami were just as eager to greet me as I was to meet them and to hear stories of how God is working through the Samaritan’s Purse OPTIC II project. 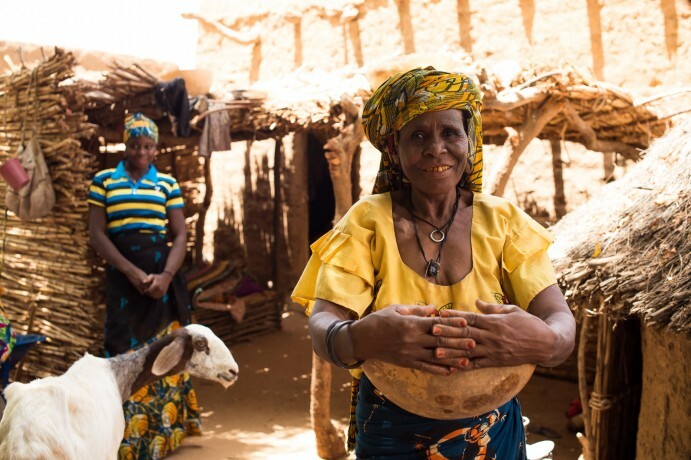 OPTIC II is a project we are establishing in villages throughout the Sahel as a holistic approach addressing water and sanitation, agriculture, and health and nutrition, all while sharing the hope of the Gospel. Samaritan’s Purse has empowered local Christian families to teach and implement hygiene and safe water practices and modern agriculture techniques. They’re also teaching how to prevent common diseases such as malaria, malnutrition, and diarrhea. These local Christians have left their homes in Niamey, Niger’s capital, and moved to the villages. By living among the people, leading through example, and building genuine friendships with families, they demonstrate Jesus’ love and tell people about Him. It was an honor to see the miraculous transformation and what God is doing in this community. The entire village was waiting to greet us with gappy toothed grins or shy head nods. They raised their hands with both palms showing and waved little shakes as a traditional welcome—an equivalent to the Western handshake. I attempted the same and waved back, which evoked cheers from the women and children in the crowd. Modern agricultural techniques and food preparation teachings have turned this malnourished and disease-ridden community into a place of exuberant hope and life. Ouma, a Samaritan’s Purse evangelist living in the village, spends time with the women and has helped them to change their cooking habits by adding moringa, acacia, and other nutrient dense foods into their standard diets of millet. Malnourishment has decreased and children are growing stronger, and because they know how to practice better sanitation, hygiene, and water gathering, fewer people are dying from preventable causes. I talked to a man who had spent the past 70 years as a devout Muslim. He shared with me how his 14-year-old son had been sick and unable to receive any treatment until evangelists Ouma and Abdoul from Samaritan’s Purse were able to arrange transport to Galmi hospital, a medical facility run by World Medical Mission doctors. Tragically, his son did not survive. Though he grieved deeply the loss of his son, Lawali was touched by the kindness and care of Ouma and Abdoul. “I was able to hear from Christians for the first time because I had seen their good works and trusted them to be good people,” he said. As one of the premier farmers of his village, Lawali has enough space to facilitate many guests so he allowed Ouma and Abdoul to show the Jesus Film on his land. After watching the film with the community, he recognized Jesus to be different than what he’d grown up believing about Him. He recognized that Jesus is God. Since then, Lawali has turned some of his property into a place to gather for church. He is helping Ouma and Abdoul host Bible studies in his home. His wife and younger brother have also given their lives to the Lord. Because of Lawali’s zeal to share the Gospel and his respect in the community, we are excited to hear of many more lives to be impacted by God’s love. The hope of the Gospel is saturating the lives of people in this and other unreached villages dotting the desert.